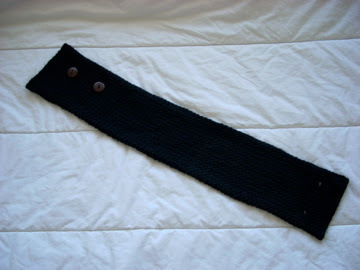 Knitting With a "Y": The Accounts of a Male Knitter: Oops, I Did It Again! Eight balls of Rowan Handknit Cotton in Lupin (whatever that is) and four balls of Brown Sheep Cotton Fleece in Willow Leaf. Why the sudden obsession with cotton? Well, the fine ladies at Iris Fine Yarns (ha, I didn't even plan that) are hosting a fun little event in honor of Earth Day, which is on April 22. The idea is to knit or crochet a market bag to use when you go shopping instead of taking the paper/plastic bags in the store. They are asking that people make these bags and then bring them into the store during the month of April to have them displayed. Of course, when I first heard about this a few days ago when I went to Iris, I thought 1. that I didn't have time to do that and 2. I didn't have the money to buy the yarn. Naturally, I went back to my dorm room and instantly began planning how I was going to make my bag. Well...I couldn't decide, so I'm making two - neither of which are going to incorporate any of my knitting goals for 2008, but I do plan to learn a new skill with each. One is going to incorporate a provisional cast-on and the other is going to... hmm.... well, it's going to have cables and seaming. Two things I do need to work on. Iris Fine Yarns is also putting together a pattern collection for all of the bags that people make and are asking everyone to sign a board saying that you pledge to take no plastic bags from store check-out areas during the month of April AND to recruit an additional person to make a similar commitment. 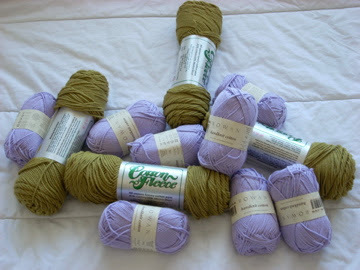 So there you go, that is why I now have 1,600 yards of cotton yarn. OH YEAH! That's another thing I have never done, knitting with plant fibers. YES! I included this picture for no reason other than the fact that it made me happy as I was walking to the yarn shop this morning. 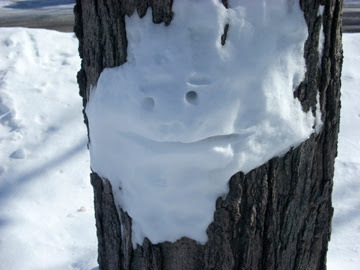 Hooray for fun children and the wacky things that they do! I finished my sock. 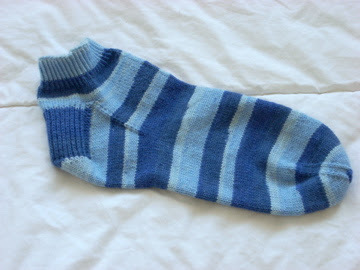 Yes, singular sock. I love it so much and it fits so perfectly and this whole sentence has to be read really fast in one breath to understand my excitement and it is so soft and I love it the end. I love this sock so much that I vowed not to start the second one until I finish my nephew's sweater and my little sister's sock. I hope that is enough incentive to get them done. Here's a project you haven't seen before. I actually knit this over Winter break and it is technically my first FO of 2008. 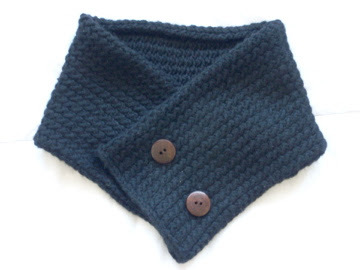 It is a fun little neck scarf, the materials for which I got from my wonderful sister as a Christmas present. I have yet to sew on the buttons, which is what has prevented me from posting about it or putting it up on ravelry, but since I can STILL not decide on which buttons to use (boo for choices), I decided it was time to acknowledge its presence. Finished Size: 5" x 24"
This scarf took me a while because I tended to pick it up and knit one or two rows at a time, or I would just not work on it at all for maybe a week at a time. Oh, and just a note about this yarn. It doesn't have very much (if any) stretchiness when knitting with it and the finished fabric is pretty stiff, but after blocking - oh my gosh. I didn't think I would ever say this and I am already making fun of my dorkiness, but it has such an elegant drape! I'm having a hard time believing that it is the same scarf that I remember knitting a few months ago. And duh, it's super soft and warm. 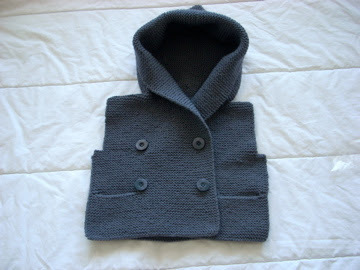 And finally, just so you don't think I have again been ignoring the wonderful Duffle Coat for my nephew Xander, here is an updated picture. I finished the hood! It was actually a lot more knitting than I expected. I even weaved (wove? have woven?) in all the ends thus far because they were driving my crazy. I now just have to knit the sleeves and have a fun little seaming party (with myself and most likely The Sound of Music to keep me company). Apparently I am incapable of sewing on buttons, so the ones you see above are also simply sitting on top of my knitting rather than being part of the project. Wow, Peter! Your knitting looks so good ALL THE FREAKIN' TIME! Not that I'm bitter or anything. Btw, how do you get your edges to look so nice on that jacket?? ?